I am beyond excited to be partnering with Vitamix and TheFeedFeed to bring you a deliciously blended spring Mother’s Day dinner! 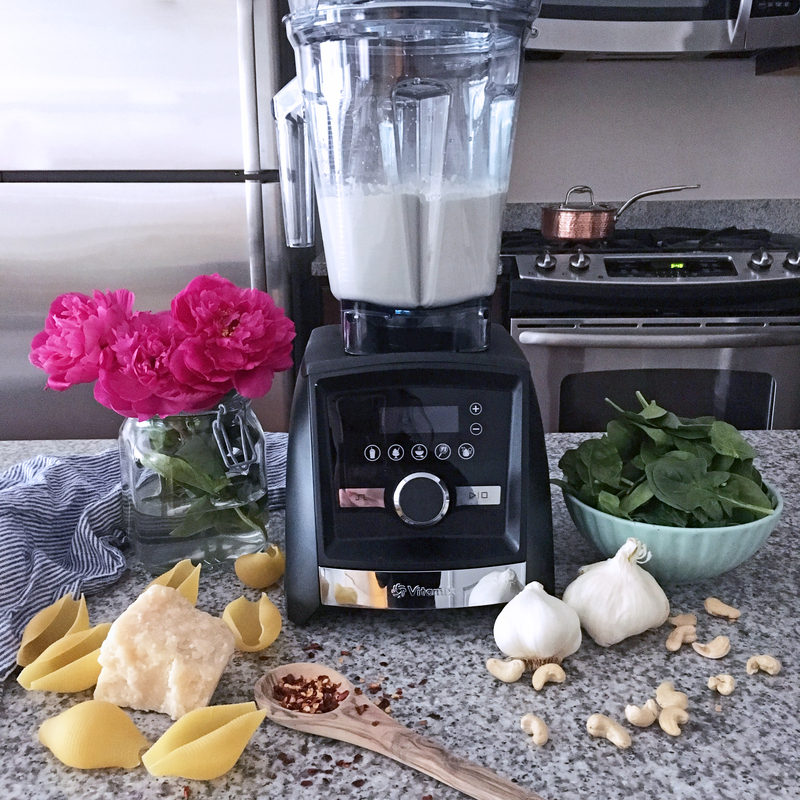 True story, after using the Vitamix A3500, I spent a weekend blending everything! I made smoothie bowls, nut butter, pesto, you name it, if it could be blended, I was devouring it! If you were watching my Instagram stories while I was cooking, you heard me say cashew cream had never become cream that quickly. It’s true! This blender is amazing, you can attach different sized containers and this works with the wireless connectivity that senses the container you’ve selected! Can I get an Amen? So for this blended deliciousness, we’re utilizing my favorite, cashew cream to make a little bit healthier stuffed shell, which is one of Mamma Lazar’s absolute favorite dishes. The cashew cream serves as a replacement for ricotta cheese! However, the blending doesn’t stop there. 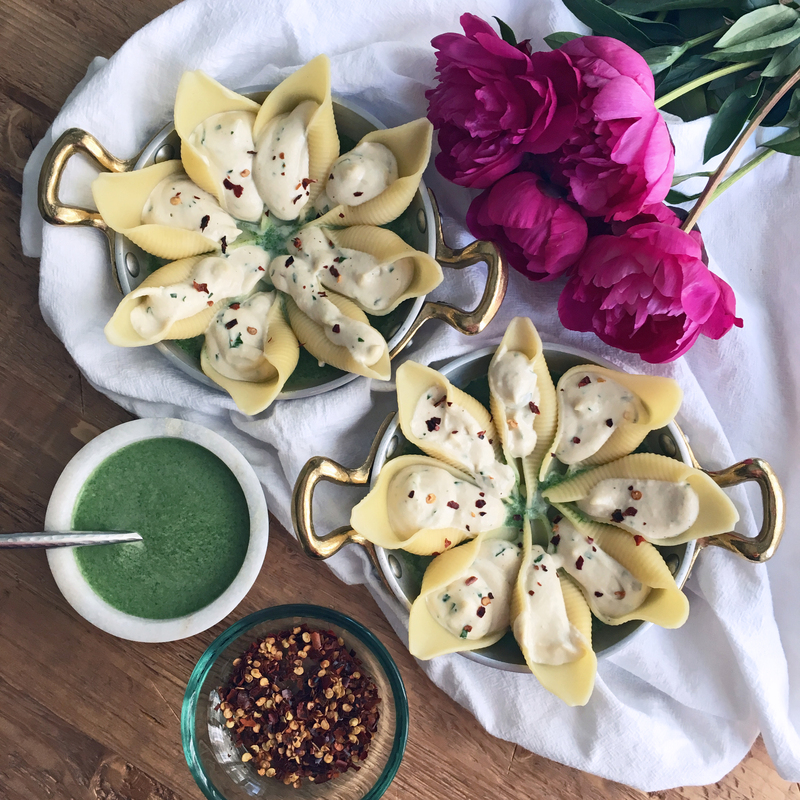 I also made a roasted garlic and spinach cream sauce that is jam packed with springtime flavor! This is a really fantastic family dinner that I’m going to be making to celebrate my mom, spring, and all the joy of the season! Enjoy! In a small roasting pan or mini coquette, add garlic and top with olive oil. Add in Parmesan, cream, and milk and blend on medium until the spinach and garlic are combined. Top with spinach sauce – a drizzle or more, it’s up to you!